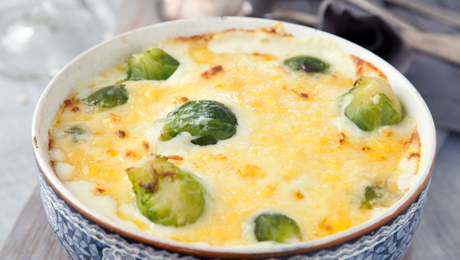 A delicious Brussels Sprout accompaniment to Christmas Dinner. Bring a large saucepan of salted water to the boil. Add the Brussels sprouts and blanch for 3 to 4 minutes or until bright green and tender. Drain and transfer to a greased gratin dish. Meanwhile, melt the butter in a saucepan over a medium heat and stir in the flour. Cook for about 2 minutes, until a light golden colour. Pour in the milk and whisk vigorously until smooth. Bring the sauce to a simmer and cook for 5 to 6 minutes. Remove from the heat and add the cheese, stirring until melted. Pour the sauce over the Brussels sprouts and season. Place the dish in the oven and bake for 10 to 15 minutes, until golden. Serve immediately.